The Talents Development Centre at Cairo’s Opera House continues to provide music and ballet education for children and young people despite political turmoil. Many aspects of life are being affected by the current period of political upheaval that Egypt has been experiencing since 2011, including the venues and companies operating under the umbrella of the Cairo Opera House. Running a wide range of activities, the Opera House aims to develop young talent through the Talents Development Centre, which was established in the early 1990s under the supervision of the late Sayed Awad, followed by Eglal Galal. A few years later, Ratiba El-Hefny took over, and in 2010 Abdel-Wahab Al-Sayed, bass baritone at the Cairo Opera Company, took over its management . The first classes of the centre were those of the Youth Orchestra. The orchestra, trained and conducted by Osman El-Mahdy consisted of students from the conservatory – the older classes of preparatory and secondary school – in addition to a few amateurs. Simultaneously, ballet was taught by Eglal Galal, while vocal classes were led by Neveen Allouba and piano by Marcelle Matta. Since these early years, classes have been run throughout the school year as an extra-curricular activity, with auditions being held at the beginning of each school year to give school children and interested young people the opportunity to join classes. As the centre has grown over the past two decades, its programmes have spread to Alexandria and Damanhour, as more classes were added. Today, the Talents Development Centre offers a wide range of music and dance classes in Cairo, including ballet, piano, flute, oud, kanoun, guitar, opera singing and Oriental singing, as well as a children’s choir and much more. Lessons are conducted by highly accomplished Egyptian artists: Opera singing is taught by tenor Sobhi Bedeir, Suzuki classes in Cairo by Osman El-Mahdy, classical guitar by Emad Hamdi, and so on. Among more recent additions to the centre are classes by jazz musician Fathi Salama. 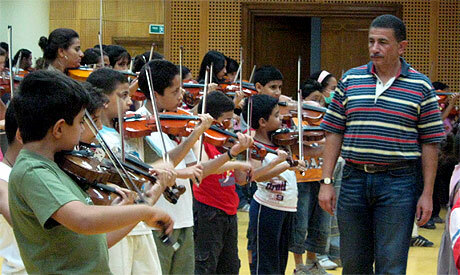 Responding to the demands of many students and parents, El-Sayed decided to introduce Oriental violin classes. Children begin with basic techniques, involving a global repertoire, before they are ready to learn Oriental styles. In Alexandria and Damanhour the centre runs a more limited range of classes. Al-Sayed is looking forward to including a broader scope of activities to these two venues; he also hopes to expand into other governorates. “It is important to spread music and arts education outside Cairo, not just in Alexandria and Damanhour,” Al-Sayed remarks. “We have to move into other governorates, including smaller cities and villages. Children and young people in Egypt, outside the major cities, are deprived of the values art can offer them; we need to change that,” he adds. El-Sayed hopes next season will afford him the opportunity to present the gems of the centre across Egypt, inviting local enthusiasts to follow suit. In 2012, El-Sayed launched the Talents Development Centre Festival, which involves performances by all classes on consecutive days, giving a sense of accomplishment to the young students, as well as showcasing their talents to a large audience. To date, two successful editions of the festival have been held on the Cairo Opera House stages. Occasionally children from the vocal classes or from the Children’s Choir of the Talents Development Centre are also invited to join the artists in professional opera and concert performances. The centre’s work is ongoing, despite the challenges which professors and students have faced during the last two-and-a-half years. Classes are held within the Opera compound, near Tahrir Square, where the tension engulfing Egypt’s cities has reverberated on many occasions. It is understood that political instability and lack of security has taken its toll on classes. Professors have tried to hold activities whenever possible, taking responsibility for dozens of children and young people who must arrive and leave safely. However, sometimes they have had to postpone or cancel classes. “No doubt, the whole situation affects the mood and progress of the students,” Osman El-Mahdy, who is in charge of the Suzuki violin classes explains. “However, all children and young musicians are very determined and continue their practice as best they can. It is tougher of course when, after a month of intense preparation, their performances on stage are cancelled,” El-Mahdy says. The Suzuki class’ end-of-the-year performance, scheduled for 4 July this year, had to be postponed due to events taking place in the city following the removal of Mohamed Morsi from power by Egypt’s military on 3 July. Though Hamdi’s guitar class was never cancelled, it was affected by the general postponement of this year’s Summer Festival, which was supposed to take place at the Cairo Opera House from 15 August to 4 September and which included two days for the Talents Development Centre. Today, the Talents Development Centre engages a few hundred children in a variety of classes, from five-year-olds to university age, in addition to a number of adults who wish to explore musical riches. The coming days and weeks will be dedicated to auditions for newcomers. It seems that despite sporadic postponements as a result of the political situation in the country, students and professors are determined to make the most of circumstances. While the centre offers a multitude of music education programmes for the most talented, dedicated and ambitious, it also has and will continue to open doors to further self-realisation, providing an important window on culture as it does so.